Kīlauea Caldera from HVO Observation Tower. May 11, 2018, 7:30 a.m.
Hawaiian Volcano Observatory (HVO) reports the East Rift Zone intrusion and seismic activity appears to be moving down-rift in a north-east direction. 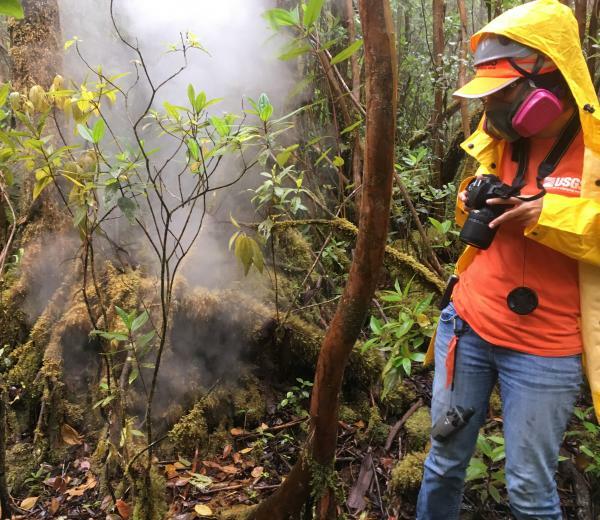 Hazardous fumes continue to be released from existing cracks and fissures, but no lava activity is occurring at this time. 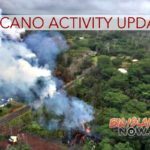 As a precautionary measure, residents of lower Puna between Kapoho and Kalapana, are advised to be on the alert in the event of possible gas emissions and volcanic eruption. Because there may be little to no advance notice to evacuate, you should be prepared to evacuate at short notice. Take this time to prepare. If you evacuate voluntarily, the Pāhoa Community Center and Kea’au Community Center are open. Food will be provided and the shelters are pet-friendly. This is a precautionary message. Eeveryone in the Lower Puna area needs to be ready. 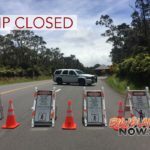 All beach parks in Lower Puna have been closed, including the Pohoiki Boat Ramp. Hawai‘i Academy of Arts and Sciences, and Volcano School of Arts and Sciences are closed today. 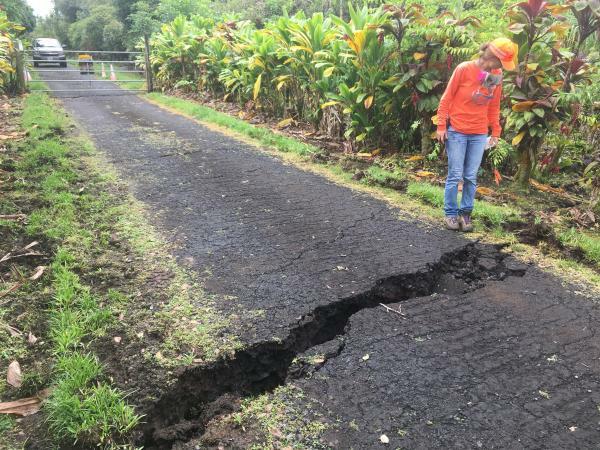 Kua O Ka La School will reopen in Hilo on Monday. Grades K through 4 will meet at New Hope Church in Hilo, grades 5 through 12 will meet at the Boys and Girls Club in Hilo. The eruptions have paused but ground cracks are widening and new steaming areas appeared yesterday. 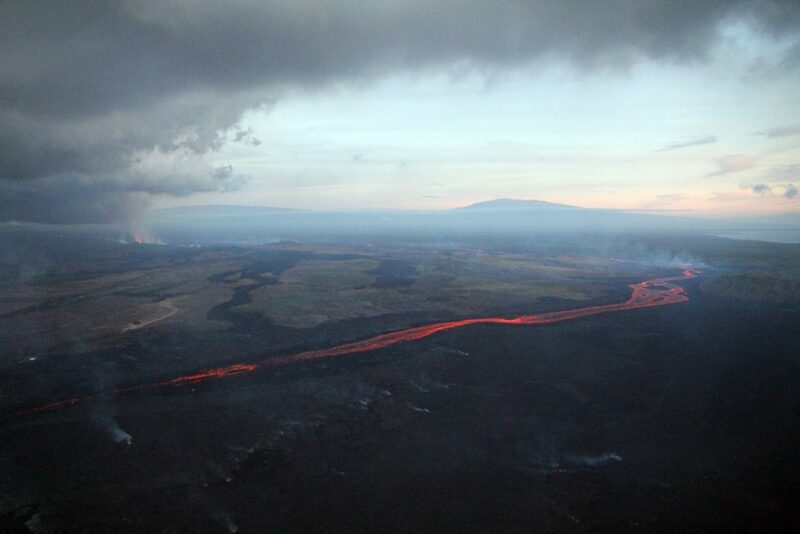 Yesterday evening, the lava coverage was reported to have increased from 116.57 acres to 117.38 acres. Aloha Broadband is offering free internet in Sea View near the mailboxes. 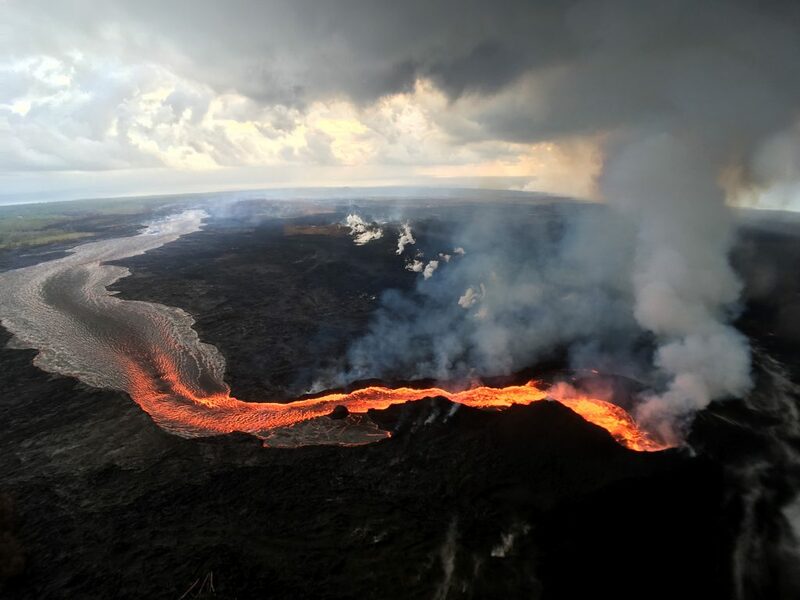 The following is an update from the U.S. Geological Survey, 6:49 a.m.
A pause in active eruption of spatter and lava along Kīlauea Volcano’s lower East Rift Zone continued through the night. However, earthquake activity and ground deformation continue and additional outbreaks in the general area of Leilani Estates are likely. Overnight, earthquake activity was concentrated on the downrift (east) side of the existing Leilani fissures. 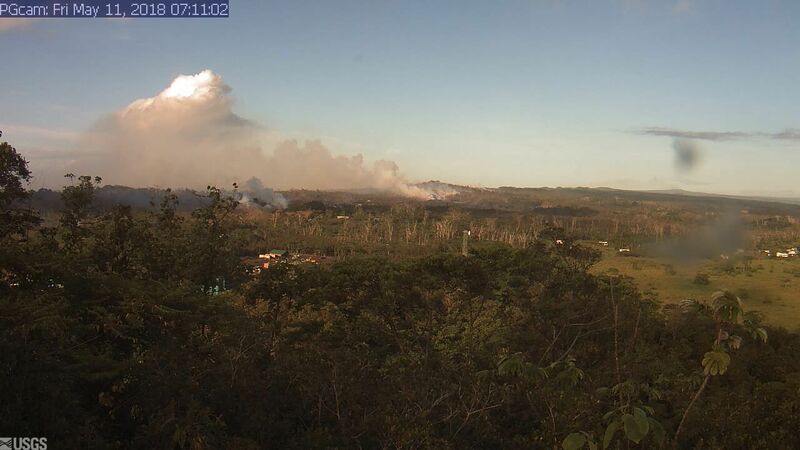 High levels of sulfur dioxide continue to be released from the fissure system. This morning, a steady plume of steam is rising from the Halema‘uma‘u (the Overlook Crater within the Kīlauea Caldera). It is expected that occasional rockfalls into the deep vent will produce intermittent, low-level ash emissions. 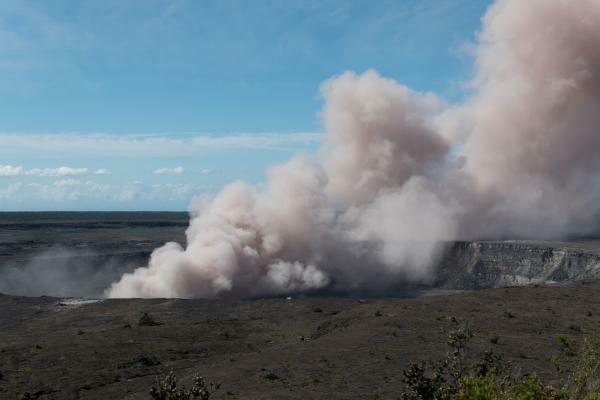 Depending on wind conditions, dustings of ash may occur in the Kīlauea summit area and downwind. More energetic ash emissions are possible. 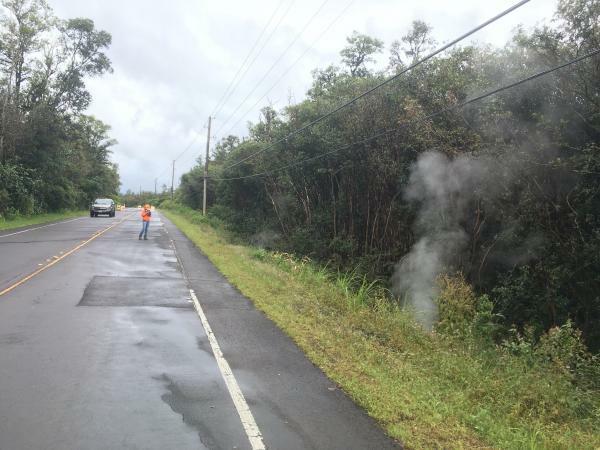 Field crews are onsite in the Leilani Estates area this morning examining the fissure vents and searching for any signs of new or resumed activity. 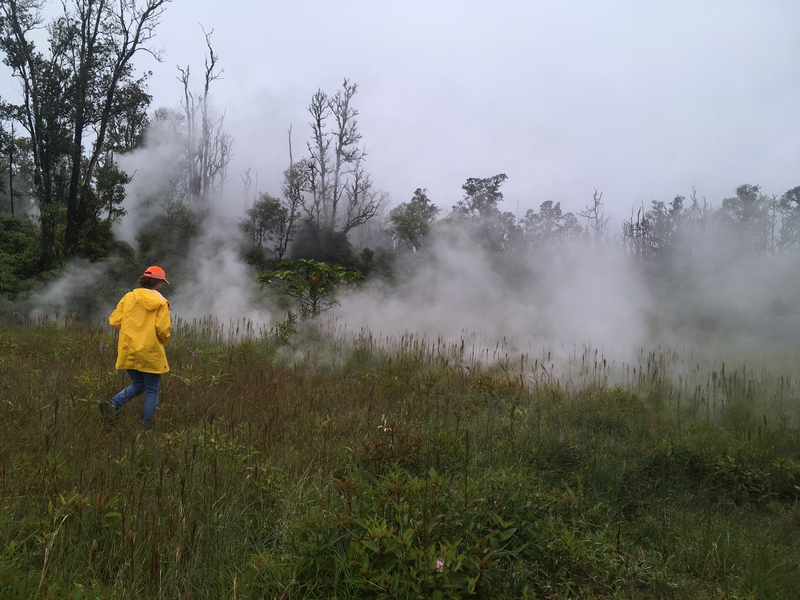 Click here for newly organized information about ash hazards, gas hazards and the Lower East Rift Zone eruption. This image is from a temporary research camera positioned near Kapoho looking northwest. 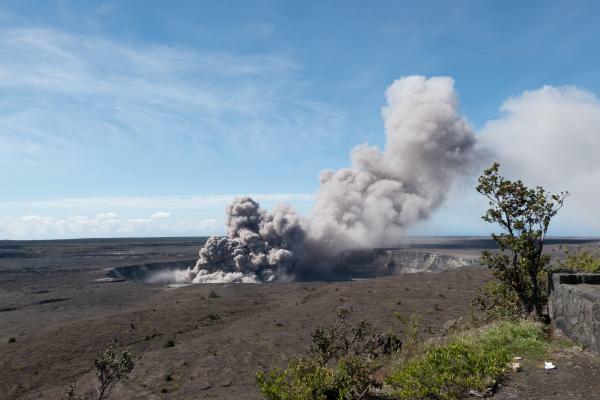 From left to right on the horizon: Puʻu ʻŌʻō vent near the left edge of the image, the gas plume from Halemaʻumaʻu crater near the middle of the image (when clear enough), and Mauna Loa and Mauna Kea farther to the right. May 11, 2018, 7:11 a.m. The images below are new photos from yesterday, May 10, 2018, which were posted on the USGS website.